What broader lessons about the Senate and its capacity for change can we draw from Democrats’ detonation of the nuclear option this past week? In what amounted to more of a surgical strike at the Senate’s Rule 22 than blowing up the institution, Democrats reduced the number of votes required to end debate on nominations to just a majority—rather that 3/5ths—of the chamber. There’s no political equivalent of the mushroom cloud, the fireball, the flattened city, the millions dead, the dazed survivors doomed to die of radiation poisoning. The only casualty is the ability of a Senate minority to routinely veto a President’s nominees for executive positions and the lower federal courts, even when those nominees have the support of a Senate majority. That ability, when you think about it, was the real nuclear option. What happened today isn’t Hiroshima; it’s arms control. Republicans disagree, even if one credible theory is that the GOP was just waiting to win the White House and a Senate majority before they made the same rule change that Reid did. Texas Sen. Ted Cruz—compared to General Custer in his efforts to shut down the government as a way to “defund” Obamacare—fretted in a Bloomberg Television interview that the change “will poison the atmosphere of the Senate,” giving everyone in Washington a good laugh to begin Thanksgiving week. In the New York Times, former Senate staffer Richard A. Arenberg worries, “the inevitable consequence of this action will be the elimination of the filibuster for all nominations and eventually for legislative matters” and concludes, “I fear the damage may be irreversible. Majorities seldom, if ever, yield power back to the minority.” And I had thought our Fourth of July celebrations had something to do with our enviable record of political majorities peacefully yielding power after losing elections. Let’s cool down the rhetoric before we advance to ever-more destructive, and even mythical weaponry. If filibuster reform is a nuclear detonation, what would we call it if Senate Judiciary Committee chair Patrick Leahy did away with the “blue slip” rule that gives senators the power to unilaterally block the nomination of any judge from their home state? Would that be a “doomsday device” option? How about forcing the Senate and House to hold up-or-down votes on an immigration reform package that gives undocumented residents a direct path to citizenship—something favored by a majority of voters? Is that a Death Star tactic? 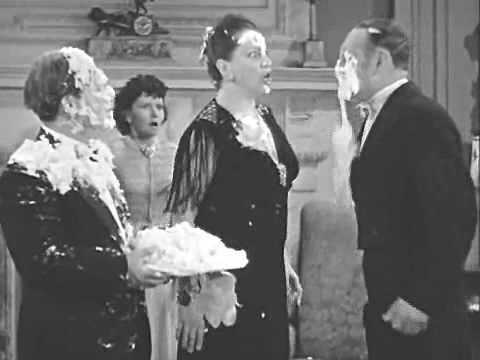 Maybe I’m just not a war movie fan, but the past few months in Washington have reminded me more of a Three Stooges short, or one of the many that climaxed with a pie fight. As I recall, the fights generally took place at pretentious, Senate-like dinner parties, and began the Stooges throwing food at each other. As the fight escalated to include servants and some of the more raffish guests, the hostess would try to maintain decorum. But there would come a point where a matronly woman in pearls would be the accidental victim of a banana cream projectile. And that would be a tipping point: It is a comedy rule that any dowager hit in the face with a pie will return the favor with surprising force and accuracy, and there will be no one left to plead for an end to the food fight. In the 1960s, for example, no one supposed that the enactment politics of Medicare had anything to do with real or potential Senate filibusters. As late as 1991, Clarence Thomas reached the Supreme Court on 58 votes, not 60. But starting in the late 1980s, the filibuster 60-vote “pivot,” as it is called, hardened and hardened. The two Bushes, Clinton, and Obama have had some of their major legislative initiatives accordingly blocked or trimmed. On the judicial front, George W. Bush ran into blockades of his district and circuit nominees as has Obama. Executive nominations have increasingly foundered. Norm Ornstein, a scholar at the conservative American Enterprise Institute and long considered a model of polite political analysis, seems to have been hit with an especially gooey dessert. The Republicans were “begging for a return nuclear response” he told Talking Points Memo this weekend. The Democratic majority was justified in its grievance but not in its rash action. […] Majority Leader Harry M. Reid (D-Nev.) proved not enough of a leader to resist the “naked power grab.” American democracy is that much poorer as a result. “Can’t we just go back to the way things were?” is an understandable impulse, and the bellicose language of the past few months in Washington is offensive when one considers the actual wars still going on in the world. But there have been real consequences of the dysfunction in Washington: an understaffed executive branch, recipients of essential government programs suffering because of sequester cuts and the government shutdown, a problem-plagued health care program that half of Congress would rather see fail than fix… The pie fight has been going on for quite some time, and it’s silly to clutch one’s pearls because of what happened last week in the Senate.